The journey began when I told the buyer of a brand new Grand Sturdy 470 that "if he needed any help in moving his dream boat" I would be glad to assist. Little did I realise then that two months later, he would take me up on my offer. And, little did I realise that moving his boat to his new location would involve a trip over 1,600 km and ten days! The Intracoastal Waterway is a 4,877 km long, partly natural, partly artificial waterway providing sheltered passage for commercial and leisure boats along the U.S. Atlantic coast from Boston, Massachusetts to Key West, Florida. It is the most popular route north or south for pleasure vessels. Along its route are beautiful marshes, historic cities and towns, and abundant fish and wildlife. The waterway is toll-free, and is maintained by the Army Corps of Engineers. The official minimum depth is four meters, although in some areas the minimum depth can be as shallow as two meters, which is perfect for the all-steel Linssen Yachts with their minimum draft and skeg-protected rudders and propellers. Because of frequent shoaling on the waterway, we sometimes experienced depths of one meter that kept the entire crew nervous and watching the depth gauge. Our trip began in Ft. Lauderdale, Florida, with the owner, Richard Malone, crew Len Smale, and myself. Under a beautiful blue Florida sky, we headed north to our final destination in Newport, Rhode Island. During the journey, we transited 11 states in as many days. Not only did our trip take us on the Intracoastal's "inside route," but also "outside" in the Atlantic Ocean, Chesapeake and Delaware Bays, New York harbour, and Long Island Sound. The initial days of the trip were conducted during daylight hours, as it is not recommended to run the Intracoastal Waterway at night. Marinas and anchorages are plentiful as are the numerous bridges that criss-cross the waterway. Fortunately, because of the Grand Sturdy's low "air draft," we seldom waited for scheduled bridge openings. Frequently large and faster boats would pass us only to find themselves waiting at the next bridge to open. Toward the end of the trip we were in the open waters of the Chesapeake and Delaware Bays and later the Atlantic Ocean off the coast of New Jersey. We began 4 hours on/8 hours off "watch sche­du­les" during this leg of the trip, although no one slept as we entered New York harbour and the exciting trip past New York and up the East River to Long Island Sound to our final des­ti­na­tion in Newport, Rhode Island. On my midnight to 4 am watch the "Linssen Lady" was 10 miles off the shore of New Jersey with 6 to 8 foot waves on our starboard aft quarter. There was a thunder­storm moving in, but I felt safe and secure with the Volvo's purring along, and the comfortable feeling that a ¼ inch steel hull was protecting the ship and all of us. 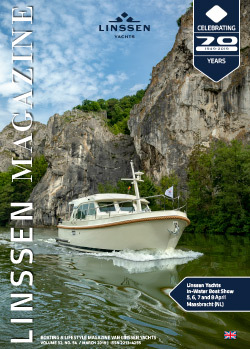 This kind of cruising is made for a Linssen Yacht. The vessel's ability to handle the shallow protected waters of the Intra­coastal Waterway, as well as the Atlantic Ocean, gives ow­ners and their guests a sense of se­cu­rity, sea-kind­ness, and peace of mind while underway. "Dank ihrer klaren Linien und stimmigen Proportionen wirkt die 500 wie aus einem Guss".